Can any subject inspire less excitement than "data quality"? Yet a moment's thought reveals the ever-growing importance of quality data. From restated corporate earnings, to incorrect prices on the web, to the bombing of the Chinese Embassy, the media reports the impact of poor data quality on a daily basis. Every business operation creates or consumes huge quantities of data. If the data are wrong, time, money, and reputation are lost. In today's environment, every leader, every decision maker, every operational manager, every consumer, indeed everyone has a vested interest in data quality. 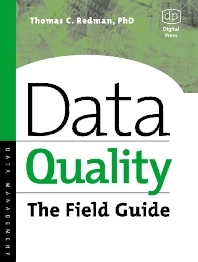 Data Quality: The Field Guide provides the practical guidance needed to start and advance a data quality program. It motivates interest in data quality, describes the most important data quality problems facing the typical organization, and outlines what an organization must do to improve. It consists of 36 short chapters in an easy-to-use field guide format. Each chapter describes a single issue and how to address it. The book begins with sections that describe why leaders, whether CIOs, CFOs, or CEOs, should be concerned with data quality. It explains the pros and cons of approaches for addressing the issue. It explains what those organizations with the best data do. And it lays bare the social issues that prevent organizations from making headway. "Field tips" at the end of each chapter summarize the most important points. Gives step-by-step instructions for applying most techniques and summarizes what "works"